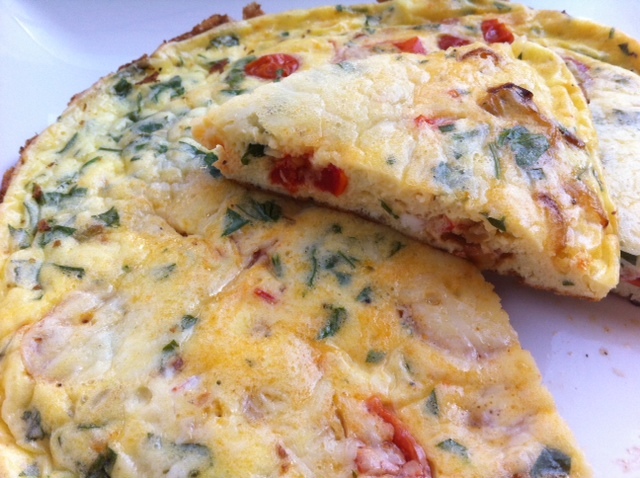 Frittata are such a fun little dish to make. You can add anything to the mix and it will turn out delicious. It’s super easy to make and doesn’t entail a lot of dish washing afterwards. These are great for back to school lunches or leftover breakfast on the run. I added some fresh tomatoes from our garden and parsley. The additional flavors just came to me as I was preparing it. That’s how easy it is. Preheat the broiler. Whisk the eggs, cream, parsley, salt and pepper in a medium bowl. Set aside. Heat the oil and butter in a nonstick ovenproof skillet over medium heat. Add the onions, pinch of salt and sugar saute until camailized, about 5 minutes. Raise the heat to medium-high. Add the tomatoes, a pinch of salt and saute 2 minutes longer then add garlic. Pour the egg mix over the tomatoes and onions cook for a 2-4 minutes until the eggs start to set. Sprinkle with cheese. Reduce heat to medium low and cook until the frittata is almost done but the top is still runny, about 2-3 minutes. Place the skillet under the broiler. cook until golden brown on top, about 5-6 minutes. Let the frittata stand 2 minutes. Using a rubber spatula, loosen the frittata from skillet and slide the frittata onto a plate and Serve. Previous Post Feastival is Back!!! Next Post Happy Labor day weekend!!! I love frittatas. I often make mini ones (using my small fry pan) for dinner. I love adding feta! Looks great! So colourful and pretty too. I love frittates – they are one of those few foods that work for breakfast, lunch and dinner!